If you have any questions or want to enquire about dates, use our form to contact Andrew Jempson or see their website for more information. At the end of a farm track between Tenterton and Rye is a pretty tile-hung cottage built in 1764. The owner’s barn stands behind, 400 sheep surround you, and the views are far-reaching and fabulous. Andrew has poured energy and determination into the restoration and has been rewarded with the discovery of Rye Shipyard timbers, an inglenook fireplace, and a wonderful red-brick floor. Outside: a brazier, a barbecue and a trampoline for kids. Inside: all is comfortable, simple and authentic, with nothing to distract from the history: leather armchairs, drop-leaf tables, a two-seater sofa, a bench coffee table, a TV hidden in a cupboard. The kitchen has a flagged floor and all mod cons, the garden room pulls in the view, and the Sussex trug overflows with goodies including the Jempsons’ soft fruits in season. Sissinghurst, Dixter and Bodiam Castle are close, Rye will charm you, but most surprising are Andrew’s history tours and bushcraft adventures (and you can help tend the sheep!). Back home to linked bedrooms sweet, simple and reached via their own stairs, one en suite, the other with a bath downstairs. Short Breaks from £85 per night. Have you visited Coldharbour Cottage? Be the first to leave a review. Not forgetting the fantastic views across the valley towards the sea. Sit in the Garden Room, read a book, have a drink and take it all in. Its breathtaking! Fun for the kids too, you can feed the chickens, collect the eggs, feed Harry the donkey (is very cheeky) and Sam the old horse. Oh and 250 sheep too - come and help us on the Farm! Join us on one of our Country Tours and see the beautiful landscape which surrounds the farm. Learn about trees, birdlife and some of the fascinating history of the site. Book today for bushcraft adventures! 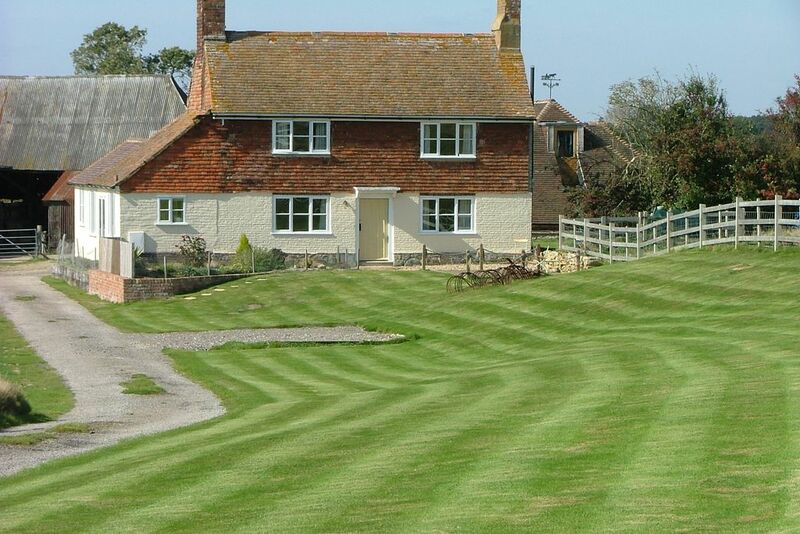 Coldharbour Cottage won the National Silver Award for the best Self Catering Cottage in 2010. Just 5 miles from Rye, 8 miles from Tenterden and 15 minutes drive from Ashford.